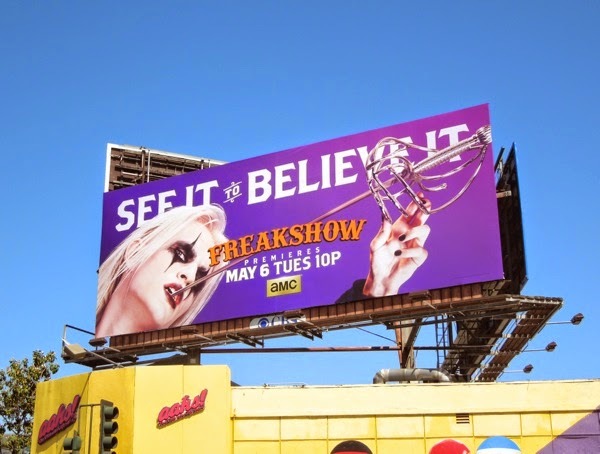 Now here's an attention-grabbing way to kick start the month of May, these colourful billboards for AMC's second season of Freakshow certainly catch your eye with their carnival tricks and performers and strong, bold colours. 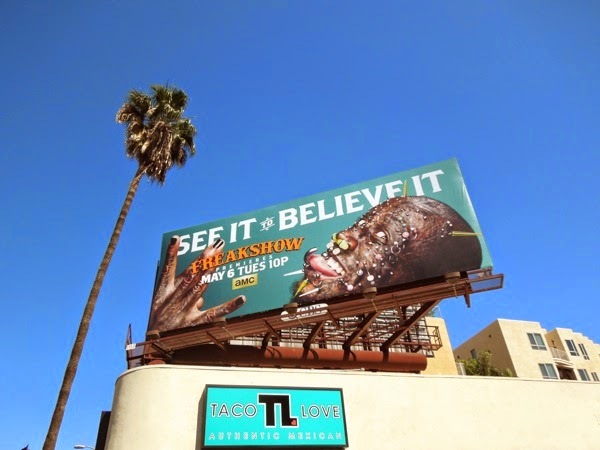 Whether it be sword-swallowing, fire-eating, or the most facial piercings, there's nothing else like these ads in the skies of L.A., which make them stand out all the more. 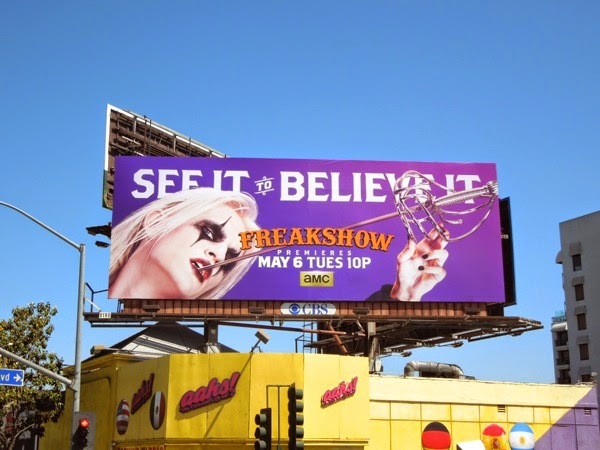 The sophomore season of the reality show continues to follow the lives of Todd Ray's Venice Beach Freakshow, with its classically-inspired circus sideshow acts and a cast that doesn't conform to the norm with all their bizarre, unique and wonderful looks and talents. 'Morgue' is a Goth 'shock' artist who has an affinity for pointy things, like swords, hooks, needles and power tools, and tends to stick them in and out of his body for the delight of audiences. 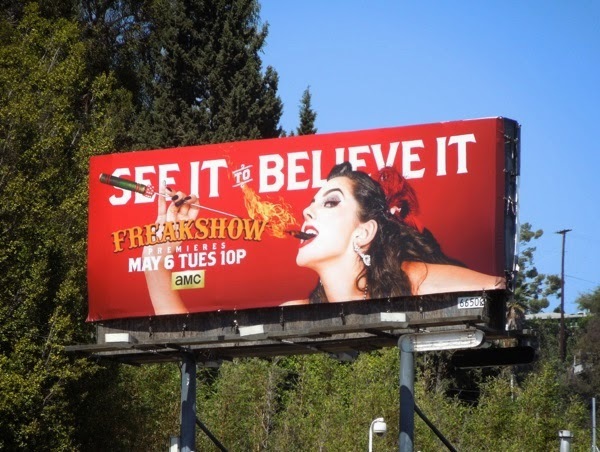 Then there's 'Asia Ray', Todd's daughter and a member of the Freakshow stage troupe since she was a teenager, with her retro costumes and 40's movie star inspired hairdo, fire-eating is just one of her on stage acts. Then there's Marcus 'The Creature' who is almost covered head-to-toe in ink, rings, spikes and more piercings, who literally has to be seen to be believed. 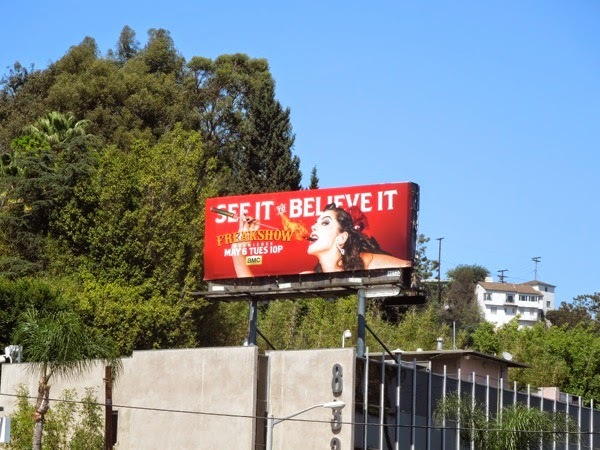 These Freakshow billboards certainly captured Daily Billboard's imagination and were photographed in three different locations along Sunset Boulevard on April 24, 2014. 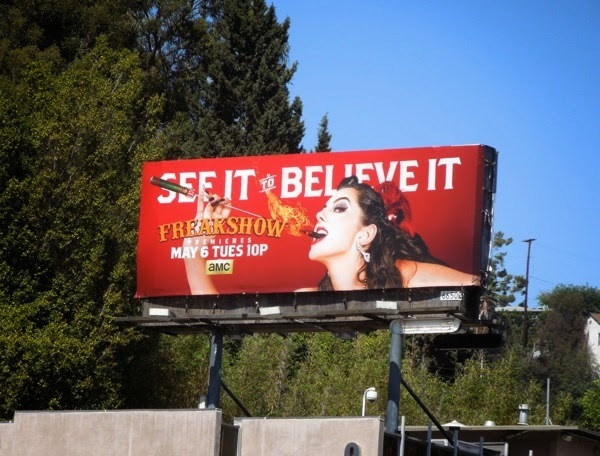 Normally AMC's shows opt for one strong visual to sell a season, so it's nice to be presented with a variety of ad creatives for this special series. 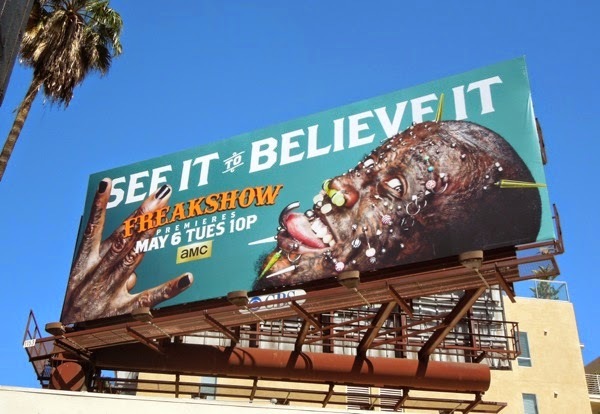 Do these billboards make you want to take a peak at the freaks, or just leave you feeling a little unsettled? Whatever you feel, it's hard to ignore them.